Shopping for a new Chevrolet Spark? 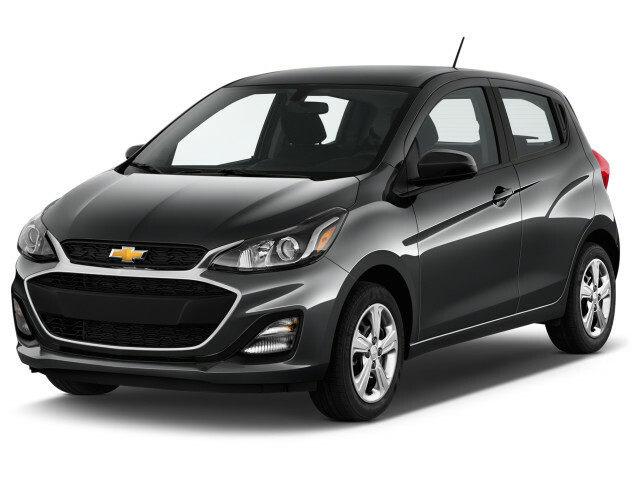 The 2019 Chevrolet Spark Activ has butch looks but no real all-terrain ability. The 2019 Chevrolet Spark makes a great urban minicar, but its appeal is limited. Some cars are honest about their intentions. Not the 2019 Chevrolet Spark. The five-door minicar that could, the 2019 Spark is offered in a bevy of trim levels and bursts with personality. It’s a cheap car that doesn’t want to be lumped with other transportation appliances. 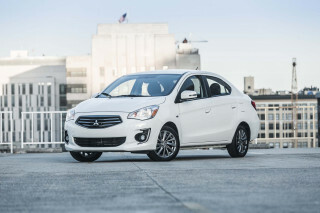 The Spark is offered in base LS, mid-level 1LT, and range-topping 2LT trim levels. The wild uncle of the lineup, the Spark Activ, wears unique body cladding and a slightly higher ride height, but all versions are front-wheel drive. This year, low-speed automatic emergency braking is a new option on the Spark 2LT only, making this the first minicar that can stop itself if it detects an impending collision. Additionally, all Spark trims gain a new 7.0-inch touchscreen for infotainment with updated software. 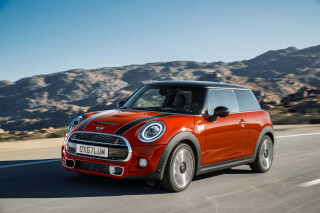 Standard Apple CarPlay and Android Auto connectivity plus a pair of USB ports help the Spark punch above its weight class when it comes to the feature count, although the Spark LS defines basic motoring with its roll-up windows and hubcaps. The pricier 2LT’s power features, synthetic upholstery, and keyless ignition are nice luxuries, but its price hovers close to larger and more powerful cars. A 1.4-liter inline-4 rated at just 98 horsepower slowly motivates all versions of the Spark. A 5-speed manual is standard, while a continuously variable transmission (CVT) is optional and should be far more common. The Spark feels more grown-up than its pint-size proportions suggest, but it is far better-suited to in-town driving than highway jaunts. Inside, the Spark has surprisingly good room for passengers and their cargo, at least considering its 143-inch overall length; the Chevy Suburban sold across the showroom is nearly 7 feet longer. For urbanites dead-set on the easiest new car to park, the 2019 Spark makes a compelling package, but even Chevy admits that’s a finite market. For most buyers, the larger Chevy Cruze compact may only run $20 more per month on a lease, which makes the Spark a tough sell. The 2019 Chevrolet Spark is pert, but hardly pretty. There’s not much flair to the Spark’s overall shape until you get to the vaguely rugged Spark Activ, which for some reason sits nearly an inch higher than the rest of the lineup. Without all-wheel drive, it’s not an off-roader, though. From the side, the Spark’s truncated tail and short overhangs are traditional city car elements. Though it stretches just 143 inches from bumper to bumper, the Spark’s 94-inch wheelbase is on the long side and that helps out with its proportions. Inside, the Spark is basic but not dour. All versions have a big 7.0-inch touchscreen for infotainment mounted high on the dash. Don’t look for dressy materials, but the Spark tries with fun upholstery patterns and painted plastic trim. 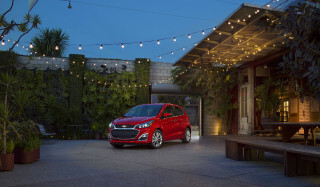 The 2019 Chevrolet Spark counts among its assets in-town maneuverability, not drag-racing. Then again, minicar shoppers hardly prioritize performance. 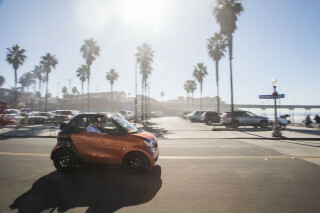 With expectations kept in check, the Spark delivers surprisingly good refinement and is a hoot to hustle around town. 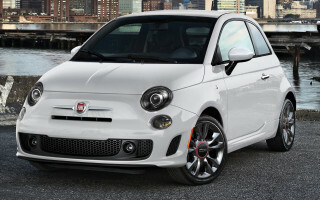 Under its short hood sits a tiny 1.4-liter inline-4 rated at 98 horsepower. Don’t look for a turbocharger, because that would be fun. A 5-speed manual transmission is standard on all trims and it works well, but the vast majority of Sparks leave the factory with a CVT that induces more underhood rumble than power. The Spark’s engine works hard and must be flogged to keep up with traffic, which zaps fuel economy, especially at speed. Its wheelbase may be on the long side for a minicar, but the Spark is still a pint-size runabout. Bigger bumps crash through, especially on lousy roads. Hit the curves and the Spark’s quick steering provides some entertainment—think go-kart, and just as slow. Where the Spark really comes into its own is in a busy urban environment. The CVT helps the engine spool up just enough to get away from traffic lights. The tiny dimensions help it squeeze into parking spots drivers of the comparatively gargantuan Toyota Yaris have to pass up. Keep the speedometer needle in the low double-digit range and the Spark’s copious road and engine noise are can be easily drowned out by its audio system, too. Roomier than it looks, the 2019 Chevrolet Spark uses its compact space well. The 2019 Chevrolet Spark feels well-built, but comfort is not one of its priorities. At least Chevy hasn’t tried to squeeze five seatbelts into it; the automaker says the Spark is a four-seater, and even that’s a stretch. Up front, the Spark’s driver and passenger have a good view out and firm seats wrapped in a variety of fun fabric and synthetic upholsteries, depending on the trim level. The rear doors open wide, but with just 33 inches of rear-seat legroom, row two is a short-distance proposition for adults. With the second row upright, the Spark’s hatchback opens to reveal just 11 cubic feet of cargo capacity. Flop the second row down and that grows to 27.2 cubes, which is about what you’ll find in a compact hatchback with the second row upright. The 2019 Chevrolet Spark offers more safety gear than we’ve come to expect from minicars. This year, the Spark offers low-speed automatic emergency braking and lane-departure warnings bundled together in the Driver Confidence package. It’s only available on the Spark 2LT, but we still commend Chevy for making advanced safety gear an option on a small car. The Spark is fitted with 10 airbags, anti-lock brakes, and stability control, plus a rearview camera and it can be ordered with rear parking sensors. The IIHS gave last year’s Spark a “Good” rating in its moderate-overlap front and side-impact crash-tests, but it hasn’t conducted the more challenging small-overlap front test. The NHTSA has not tested the Spark. The 2019 Chevrolet Spark has some nice surprises inside, though it’s hardly luxurious. With four trim levels on offer, the 2019 Chevrolet Spark lineup is surprisingly broad. Still, no version is particularly lavish and the Spark LS is about as basic a car as shoppers can find on the road today. The Spark lineup starts with the LS trim level, which features parent company General Motors’ OnStar connectivity with an integrated 4G LTE antenna for wifi as well as a 7.0-inch touchscreen for infotainment with standard Apple CarPlay, Android Auto, Bluetooth, and two USB ports. That’s nice tech, but that’s about where the features stop: roll-up windows, manual door lock, and hubcaps are all part of the equation. The Spark 1LT adds power windows and locks, plus remote keyless entry and alloy wheels. The Spark Activ builds on the 1LT with heated seats up front and a slightly raised ride-height. Next up, the Spark 2LT discards with the Activ’s taller suspension but includes parking sensors, and keyless ignition. It’s also the only Spark available with automatic emergency braking, which is bundled with blind-spot monitors in the Driver Confidence package. That’s desirable safety gear, but it pushes the Spark into compact car pricing. You have to really want a minicar to spend upward of $18,000 on a Chevy Spark. We’d probably start and stop with the Spark 1LT with the standard manual transmission for about $16,000, although we might splurge for a more expressive paint color like the $395 mint green. The 2019 Chevrolet Spark’s low power output means its engine is always working hard. Officially, the EPA hasn’t rated the 2019 Spark, so our score here is based on estimates from Chevrolet that shouldn’t stray far from last year’s model. The Spark with the optional CVT rates 30 mpg city, 38 highway, 33 combined, while the standard 5-speed manual comes in at 29/39/33. Many subcompact and compact cars sip less fuel than the city-sized Spark simply because they have a better power-to-weight ratio. The Spark must be driven hard to keep up with traffic, which cufts into fuel consumption. Looking for a different year of the Chevrolet Spark?